Stalley, the proud owner of the best beard in hip-hop and the 21st best rap album in 2011, has unveiled his new music video for “Go On,” from his re-released mixtape Lincoln Way Nights. The clip avoids all the tropes and clichés of most hip-hop videos and instead just follows the Ohio rapper on a routine day of chilling in his apartment and walking the streets… except that with all of Stalley’s actions, he leaves a frozen Stalley clone in his wake. That might sound like it makes no sense, but just watch it: The Walu-directed video’s awesome multiplicity effect makes Stalley’s mundane activities like eating fruit salad and sneaker shopping fascinating to watch. “Go On” also features the best use of church bells in a beat you’ll hear this year. 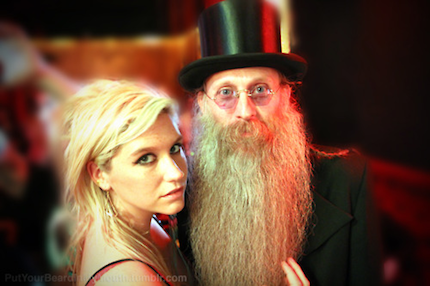 After you watch the clip, click on over to Ke$ha’s new beard blog, which is exactly what it sounds like. To be fair, this didn’t exactly come out of nowhere. You may recall the final line of “Your Love Is My Drug” is “I like your beard” and the pop star has been tweeting about her facial hair love for quite some time.